John Gleeson censured by the press for wife beating, November 10th 1855. This post contains descriptions of domestic violence. My book 'Notorious' is about the lives of the inhabitants of two streets in Cardiff renowned for drinking, prostitution and semi-organised crime. Before writing Notorious I hoped to find some 'interesting' characters and I have found them in abundance. More than half of them are women and their stories are central and influential in this microhistory of a criminal society. Knowing that Charlotte Street and Whitmore Lane was a 'rough' area I was also prepared for some violence. What I wasn't prepared for was the scope and depth of the violence against women. When it comes to the life stories of the 19 females in my book, 17 of them were assaulted by men, mainly their partners and official or unofficial husbands, many of whom were also their bullies (pimps). The only women not reported to have suffered violence are two brothel keepers, one with an elderly husband twenty years older than herself who soon went blind and the other without use of her legs since birth. Of course it's upsetting that these women were on the receiving end of so much domestic violence. What is equally hard to accept is that in the majority of cases brought to the courts the women would not prosecute their men. Often they were released, or the police charged them if they had witnessed the attack (there was no public prosecutor in those days- so someone had to charge or there was no crime). Even more hard to accept is how these women would stay with their abusive partners for years, in some cases decades, afterwards. This is what delineates 'real' history from the popular fictional histories on TV. Ripper Street and Peaky Blinders spring to mind as they are also set in a criminal context. Violence in historical TV dramas is often portrayed through our own viewpoint of good/bad, justified/abhorrent. Violence towards females rarely rears its head, if it does it's what the 'bad guys' do. The women are strong enough to ward it off before it happens, or be unforgiving if it does. People behave how we hoped they would behave rather than as they did because the script writers censure and moralise their actions so they are palatable to a modern audience. We cannot allow our male leads to hit women and we cannot allow our female leads to be hit either. The 19 female lead characters in Notorious do not come up to this fictitious level of moral fortitude and nor do the 15 males in the book, as 12 of these also use violence against females. John Gleeson, the 'Dastard' of the title, was a lodging house keeper and a long term wife beater. He assaulted Ellen throughout 1855, then again in 1858. His wife never appeared to give evidence against him and he was always released. He must have done it more frequently than reported as in 1858 his wife Ellen says she would not press the charge as he had 'not offended for twelve months' and she would 'forgive him till the next time.' They stay together until he dies in 1869. In contrast to John's wife beating there is William Bennett, aka 'Driver', a boatman and a bully (pimp), who used violence as part of his job. A chronic beater of women, he assaulted the 67 year old brothel keeper Mary Prothero with a thick stick in 1845. Brothels needed bullies and in a lot of ways the more violent they were the better. Driver, despite his lack of self-control, was not banished from her house as in 1849 he is still sat lounging in her brothel. There he almost breaks the leg of Prothero's 15 year old granddaughter in anger and then breaks her mother's nose after she remonstrates with him. Alfred Burrows, another boatman and bully, beat up a prostitute that he fancied in 1846 because she 'called him names' and refused his advances. Daniel Ryan, a boatman, thief and a bully punched a woman with her baby in her arms at the end of Whitmore Lane in 1856. He beat his partner Honora Donovan in 1860 and 1861, both times she refused to charge him. When he beat her in January 1862 with a poker, she did charge him and he got one month in prison. They got back together in February as soon as he got out of gaol and within a month he attacked Honora again. Honora did not just take it this time, she retaliated by throwing boiling water in his face. 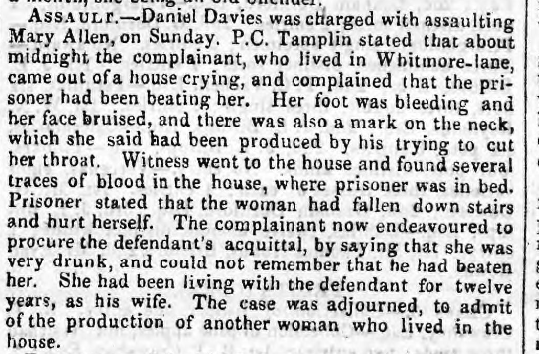 He committed a horrific attack on his next long term partner Margaret Sullivan aka 'Irish Meg' while she was in bed with their young child in 1855. When Meg went downstairs he punched and kicked her some more then, saying 'I might as well be hung for a sheep as a lamb,' he slammed a jug into her face. 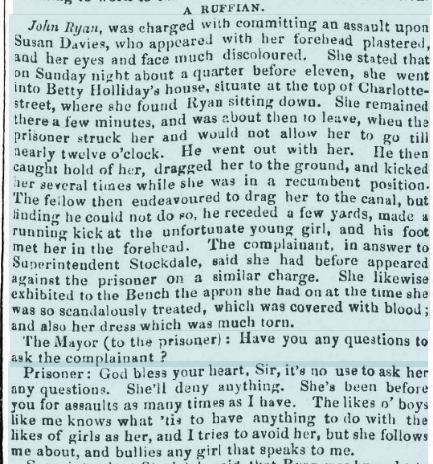 John Ryan assaulted yet another partner, Ann Green, in 1863. She fought back with a 2lb weight. I know it says 'John Bryan' in the report but it is the same John Ryan. The rest of the men in Notorious - Harry Kickup, Davey Rees, Lewis Leyshon, Jack Matthews, Ned Llewellyn, Billy Shortlegs and Mouse all beat working women or their partners/wives, in some cases repeatedly. Of the men in the book only a policeman, the Superintendent of Cardiff police and a one-legged man are not recorded as committing violence against women. June 16 Ann Yarwood is living at The Crown Beerhouse with Davey Rees. Even though it’s run by her mother Mary she still has to pay her way. She gives her two shillings sixpence a week for a room and extra for coal and candles. It’s the early hours of the morning when she gets back to The Crown after a night of working. She says hello to the men and girls still gathered in the bar downstairs. Her sister Catherine is working it and she asks her to carry some liquor up to some men in the upstairs rooms. She gives the men their whisky and they thank her with a small cheer. Then she goes to her room where Davey Rees, a permanent fixture at the Crown as its chief bully, is in the room asleep. She checks on her one year old daughter Mary who’s fast asleep and starts to get ready for bed. She gives Davey a tap as she comes up to him. Davey gets up, still half drunk and angry with her that she’s been out this long and woken him up. He picks up a poker he keeps nearby. The whole house soon hear the screams as the first two blows hit her right arm as she tries to shield her face. When her arm goes down he keeps hitting, the metal bar crunching into her shoulder, hitting one side of her head then the other, half ripping off her ear. As the metal bar rips open her face and forehead down to the bone she slumps and loses consciousness. Blood flies up in a spray along the wall. He only stops when through his red rage he hears the door banging and a voice shouting. Catherine kicks through the door and sees her sister lying in an expanding pool of blood with Davey standing there holding a screaming child. She runs downstairs and finds PC Pepper on the street. Davey’s gone by the time they get back and go upstairs. Ann is conscious now and she tells Pepper that Davey did it and he sees the blood stained poker in the room. The coppers catch a bloodstained Davey a little while after in Whitmore Lane and he admits in the cell he gave her a little clip with a poker. The court send him down for 12 months hard labour. If this was written as 'TV history' her mother, a powerful brothel keeper, would 'save' her daughter, or her two brothers, both strong violent men themselves, would 'sort out' Davey to protect their sister, or she would retaliate herself- Ann Yarwood could dish out violence when she wanted to- but none of this happens because this is not fiction. What really happens after this attack is two weeks later Ann Yarwood goes to prison herself for brothel keeping (for keeping 31 Charlotte Street- see my other post on this house). After that she stays with Davey for a long time, in fact they marry in 1879 after 17 years together. This all makes for uncomfortable reading. All of the men are bad men, most are career criminals after all, and violence was an everyday occurrence. As for the women if this was made into a TV drama would it be acceptable to the audience to have Ann Yarwood, as a very strong female lead, badly beaten up with a poker and then continuing to live with Davey Rees? No, of course not, a plotline would develop where this wrong is righted. The history in Notorious doesn't make good fiction. Injustice exists largely unchallenged, society often crushes these women and their stories are too often happy never after. I would not dream of leaving this part of their lives out of the book however. My firm view is that domestic violence should be laid bare, then as now. Period (and contemporary) dramas should always strive to portray and uncover issues like the hidden barbarity that is domestic violence and violence against women in general. Too often it is ignored and when it is portrayed it is invariably 'solved' in the way we would like to solve it ourselves. Reality, then and now, tells us different. The women in Notorious are often strong, powerful and independent women but they're often victims of violence as well. This part of Welsh history needs to be told as it was. It is our duty to retell their stories, warts and all, however unpalatable it is to us. These women would have laughed, drank, danced and dreamed together but their lives were often brutal, uncompromising and often incomprehensible to us. We can't airbrush over the experiences of these women and turn them all into Long Susans or Roses. 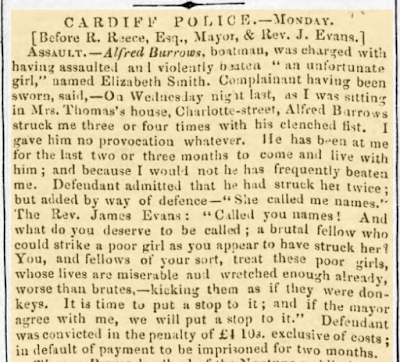 1855 April 11 Cardiff and Merthyr Guardian p.2. 1855 Nov 10 CMG p.8. 1859 January 1st CMG p.8. and 1859 January 1st Cardiff Times p.4. 1845 April 19th The Cambrian p.3. 1849 June 9th CMG p.4. 1846 October 10th CMG p.3. 1865 September 22nd CMG p.8. 1860 February 18th MM p.8. 1861 October 25th CT p.6. 1862 January 24th CT p.6. 1862 March 21st CT p.6. 1851 December 6th CMG p.3. 1855 June 9th CMG p.5. 1863 August 28th CMG p.7. 1858 June 19th MM p.3. 1863 June 19th CT p.7. Marriage 13 September 1879, St David's Cardiff. 1864 August 19th CT p.7. This article in this form is copyright Anthony Rhys, 2017. All article screenshots are from the National Library of Wales online newspapers or images taken from British Library Microfiche. The book 'Notorious: Charlotte Street and the Lane' is out some time some where soonish.